Mesenchymal stem cells (MSCs) have potential uses in regenerative medicine, but usually ex-vivo expansion is needed to achieve clinically useful cell numbers. Very recently, it was shown that the regenerative capacity of MSCs cultured in stiff microenvironments could be altered in a time-dependent manner (e.g., a mechanical dosing analogous to a chemical one). 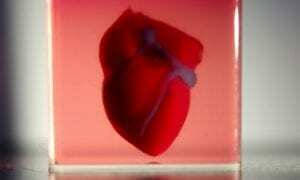 Insights into the expansion of human MSCs (hMSCs) and a better understanding of the mechano-regulations of regenerative processes have been provided, in research lead by Professor Kristi Anseth of University of Colorado Boulder. 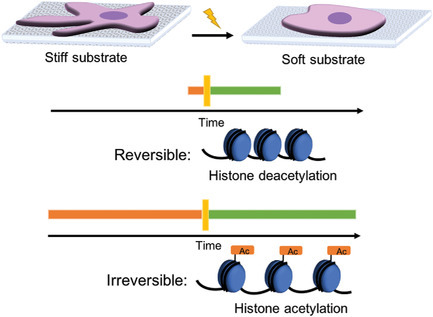 Short‐term and long‐term mechanical dosing shows that histone acetylation and chromatin organization can be reversible or irreversible, suggesting epigenetics is a mechanical memory keeper. The impact of exposure to stiff environments on the nucleus and the epigenome were examined, while using light-controlled, in-situ softening hydrogels. This material enabled changes in chromatin condensation and histone acetylation to be studied depending on so-called mechanical dosing (time of exposure to stiff substrate before switching to soft substrate). It was revealed that stiffer substrates promote increased acetylation, changes in nuclear morphology and chromatin condensation, and altered gene expression in histone deacetylases (HDAC) 1, 2, 3 and histone acetyltransferases (HAT) 1. 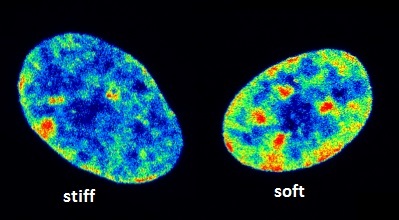 The dosing experiments revealed that these changes were reversible when cultured on stiff substrates for one day and soft substrates for five days, but irreversible when cultured on stiff substrates for ten days followed by soft substrates for ten days, matching the reversibility/irreversibility of Yes-associated protein (YAP) nuclear localization. Notably, HAT1 appeared to play a role in this (ir)reversibility as messenger ribonucleic acid (mRNA) levels remained upregulated to maintain histone acetylation levels after softening. The amechanical memory in bone-marrow-derived hMSCs was shown to be mediated in part through epigenomic modifications while using phototunable hydrogels.